Old Gold: What's in a Name? Frederick W. Kent Collection of Photographs, UI Special Collections The University of Iowa’s Pentacrest in 1958. Editor’s note: In Old Gold, University archivist David McCartney looks back at the UI’s history and tradition through materials housed in University Archives, Department of Special Collections, University of Iowa Libraries. If Old Gold had a list of top-10-asked reference questions at the University Archives (and well he should), surely one of them would be: When did the State University of Iowa become known simply as the University of Iowa? Variations on that theme include: Weren’t we once also known as Iowa State University? Aren’t we still officially the State University of Iowa? Has confusion ensued? The short answers are Oct. 22, 1964; sort of; yes; and yes. It’s also correct to say that our esteemed institution has always been named the State University of Iowa. It’s complicated, as they say. General Catalogs Collection (RG 01.08) Title page from the 1870 general catalog. Some background: The State University of Iowa was established in 1847 as the second official act of the General Assembly of Iowa. Lawmakers declared that the fledgling school would serve as the state’s institution of higher learning, one that would provide the state its future doctors, lawyers, and other professionals. The state university, if you will. 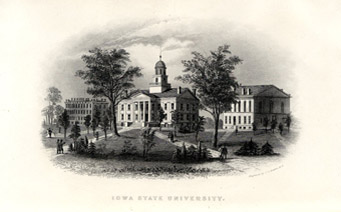 Eleven years later, in 1858, legislators established the Iowa Agricultural College and Model Farm at Ames. And in 1876, the Iowa State Normal School in Cedar Falls, a teacher-training academy, was founded. 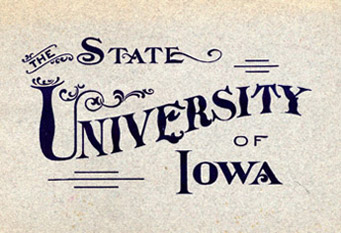 During these early years of public higher education in Iowa, only the Iowa City institution included the word university in its title. 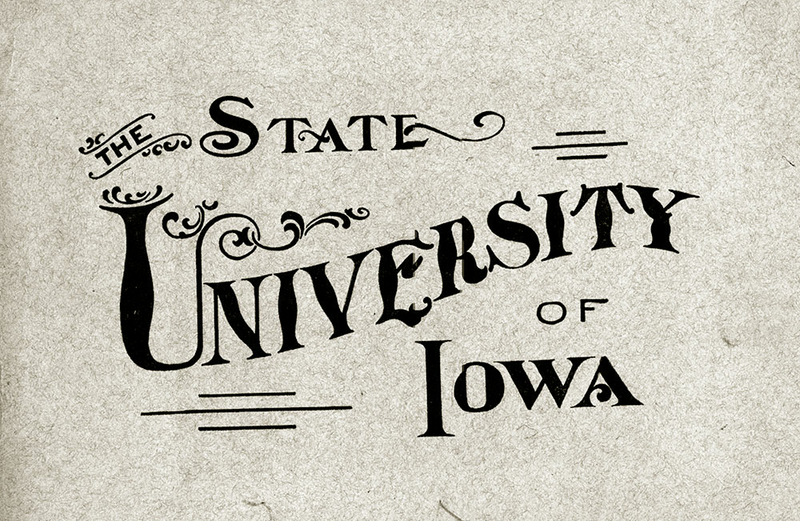 This exclusive status seemed to allow SUI administrators to take liberties with the school’s name, referring informally to it in catalogs and other publications as “Iowa State University” during a good part of the late 1800s. The practice, which never officially changed the SUI name, appeared to have ended by the 1890s. Official Board of Regents, State of Iowa, meeting minutes throughout this time consistently referred to “State University of Iowa,” however. In 1898, meanwhile, the Ames campus was renamed Iowa State College of Agricultural and Mechanic Arts; in 1959 it was again changed to its present-day Iowa State University of Science and Technology. The Cedar Falls campus changed its name in 1909 to Iowa State Teachers College, and again in 1961 to the State College of Iowa before finally adopting the University of Northern Iowa in 1967. Let’s see: By the early 1960s, Iowa’s three public institutions shared the words state and Iowa. What’s worse, two of them even shared the words state, university, and Iowa. Confusion ensues. What to do? General Catalogs Collection (RG 01.08) A view of the "Iowa State University" campus in Iowa City—not Ames—from the 1870-71 General Catalog. Mason Ladd (23BA), dean of the State University of Iowa College of Law, anticipated this situation in 1957, when officials at Ames proposed renaming that campus. Ladd, in a Dec. 7, 1957, memo to SUI president Virgil Hancher (18BA, 24JD, 64LLD), pointed out that changing the Ames campus name to Iowa State University would be an “unconstitutional act. … Furthermore, it would involve great confusion in our statutes and require material revision in wording throughout the Code where either the State College or the University are mentioned.” (Papers of Mason Ladd, Box 6, folder “Brief – SUI Change of Name”) Apparently, President Hancher did not pursue Dean Ladd’s objection—or if he did was not successful—and ISC became ISU in 1959. By 1964, the name confusion that Ladd predicted became reality, frustrating SUI officials. Howard Bowen (35PhD), by then president of the Iowa City campus, had an answer: Shorten the name of SUI in everyday usage to the University of Iowa, while retaining its full, original name for legal and other purposes. On Oct. 22, 1964, the Board of Regents approved a resolution authorizing just that (Board of Regents minutes, Oct. 21–24, 1964, pages 170–171). To this day, people still occasionally (and understandably) confuse the names of Iowa’s public universities. Old Gold and his colleagues at Iowa Agricultural College and Model Farm/Iowa State College of Agricultural and Mechanic Arts/Iowa State University of Science and Technology and Iowa State Normal School/Iowa State Teachers College/State College of Iowa/University of Northern Iowa are always pleased to clear up this question. Title page from the 1870 general catalog. 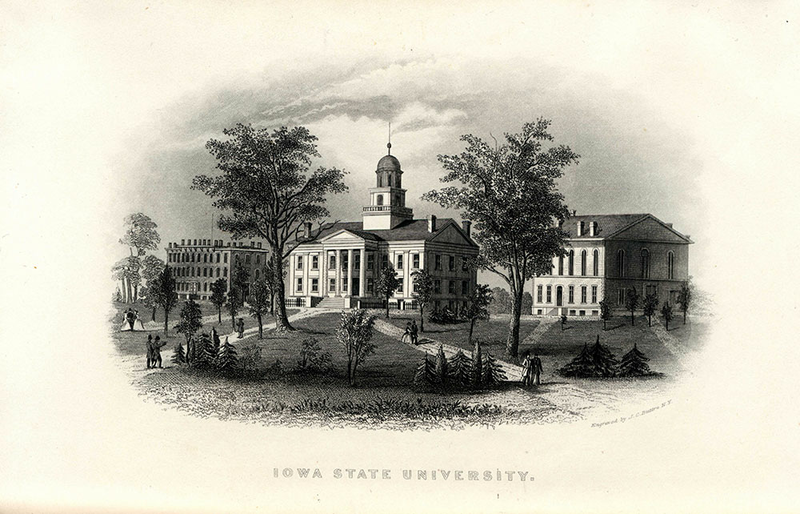 A view of the "Iowa State University" campus in Iowa City-not Ames-from the 1870-71 General Catalog.